Stop The Pain Before It Stops You!! You Don't Have To Live With That Pain Anymore! Thanks to the concerted efforts of a team of top physicians and medical engineers, a major advancement in medical technology was made to effectively treat low back pain resulting from herniated or deteriorating discs. The result of their efforts not only significantly reduces back pain in 92% of patients, but enables the majority of patients to return to more active lifestyles. This new treatment uses state-of-the-art technology to gradually relieve neurocompression often associated with cervical (neck) lower back pain. The process has been proven to relieve pain by enlarging disc space, reducing herniation, strengthening outer ligaments to help move herniated areas back into place and reversing high intradiscal pressures through application of negative pressure. An upper chest harness / shoulder support and a pelvic harness are used to help distribute the applied forces evenly. Once in place, you are slowly reclined to a horizontal position. Following the physician's orders, the therapist localizes the pain, makes any adjustments and directs the treatment to the proper area. 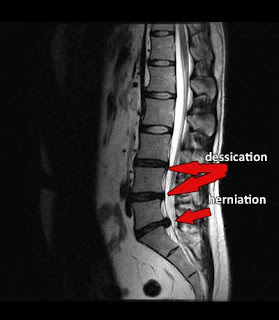 The pull of decompression helps to mobilize the troubled disc segment without inducing further damage to the spine. Following each therapy session a cold pack and/or electrical muscle stimulation pad is applied to help the paravertebral muscles consolidate and strengthen after treatment. This also prevents muscles from swelling and going into spasm. Come by and take a free tour of our facility in Manhattan. We will answer any of your questions or concerns, including questions regarding financial issues. The DRX 9000 is the only table that has double blind clinically studies proving its effectiveness.